The solution will halve the time it takes to load and unload the processed and packaged krill, says Per Arne Rindarøy, CEO Aukra Maritime. specifically designed to have as minimal an impact on the environment as possible. The vessel will comply with the International Maritime Organization’s (IMO) Polar Code. 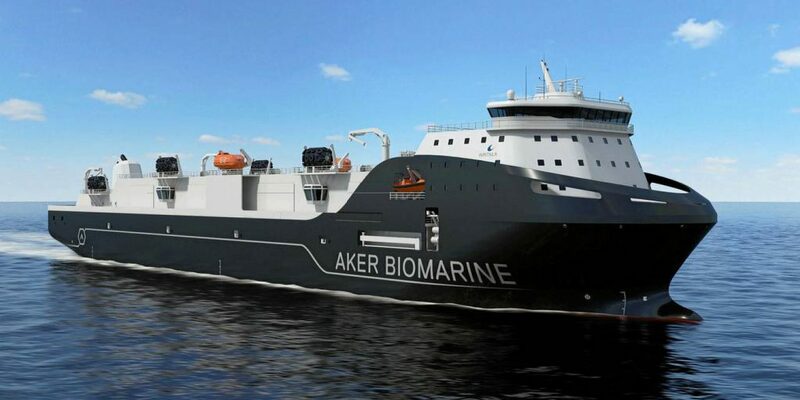 The new support vessel with a price tag of 65 MUSD will replace Aker BioMarine’s existing support vessel, La Manche. 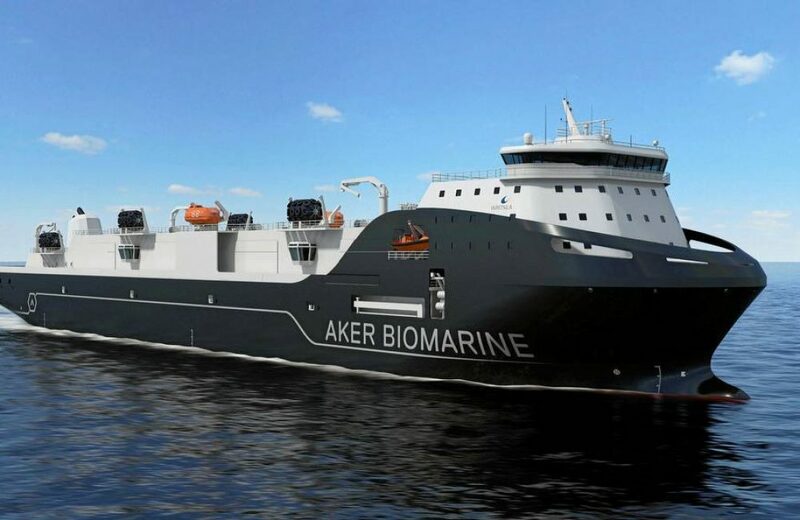 friendly technologies, such as the hybrid propulsion system, and an advanced heat recovery system that helps to reduce the carbon footprint even further,” says Eldar Vindvik, Director Fleet Renewal at Aker BioMarine. “We are proud to have been selected to design and equip this vessel. It will be a customized vessel designed specifically to meet the owner’s operational requirements in a challenging environment. It emphasizes once aga in Wärtsilä’s comprehensive strengths and capabilities, as well as our broad offering to the marine market,” says Lilli Chi, Managing Director Wärtsilä Ship Design. Featuring frequency-controlled thrusters, to avoid zero pitch loss and reduce underwater noise, the vessel will also be equipped with Dynamic Positioning capabilities, which removes the need to drop anchor during transhipment, eliminating any impact on the ocean floor. “We have extensive experience among others in building drilling platforms to the world’s most demanding sea conditions. So the construction of the new transport vessel that will face equally challenging conditions in the Antarctica is a project we cannot wait to get started,» said Wang Jianzhong, CEO and President of CIMC Raffles. The new vessel will also feature a custom cargo handling system from Norwegian supplier Aukra Maritime, which will halve the time it takes to load and unload the processed and packaged krill. “This contract is incredibly important to everyone at Aukra Maritime, and will ensure operation and work for around 30 employees for almost two years. The fact that Aker Biomarine uses Norwegian suppliers on their projects show that they are committed to quality and that they are supporting the maritime cluster we have in Norway. This strengthens us in the belief that our commitment to quality and technology development has been correct,» says Per Arne Rindarøy at Aukra Maritime. “The vessel will be constructed in China where there is unique competence for building such large-scale support vessels. The vessel will be equipped with state-of-the-art technology from a number of Norwegian suppliers, many of them who we have great working relationship during building our new krill vessel, Antarctic Endurance,” Vind vik adds. Contact Per Arne Rindarøy for more information. Aukra Maritime AS is a supplier of innovative products and solutions for maritime operations. Our equipment can be adapted to different needs. At Aukra Maritime we design, develop and manufacture lifting and handling solutions for demanding maritime environments. Our product portfolio includes deck cranes, davit systems, rescue deployment systems, hydraulic operated gates, cargo hatches and control systems for all kinds of deck operations. We can offer both stand-alone equipment and bespoke solutions. Our products meet the highest quality standards. Aukra Maritime is ISO 9001 certified and has a proven track record for consistently providing products and services that meet customer and regulatory requirements.